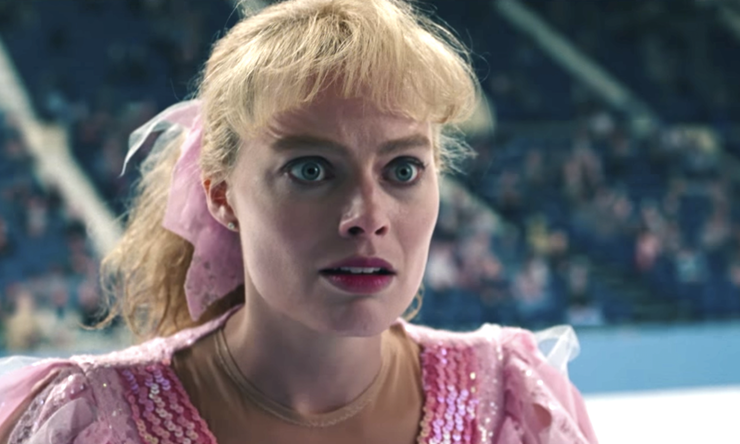 And now, the five most unexpected words of the holiday movie season: Margot Robbie is Tonya Harding. Believe it. The delicate Australian beauty doesn’t seem like the most obvious choice to play a blue-collar, chain-smoking, beer-guzzling, big-haired disgraced American figure skating champ, but her dazzling performance on and off the ice in I, Tonya will make your head spin. She was never a prototypical ice princess. As a self-proclaimed red neck in Oregon, little “Tonnie” grew up learning how to shoot bunnies and chop wood. Her dad split early. Her joyless and ruthless mom (the incredible, scene-stealing Allison Janney) doled out slaps instead of hugs. The only place Harding felt free and happy was on the ice. Mom pushed her into private lessons at the local rink at age three. She was winning local contests in grade school. By the time she reached puberty, Harding zipped across the ice at an elite level. Even then, she was the bulldog in the china shop. Ice skating, you see, is a weird sport. Jumping the highest and spinning the fastest alone doesn’t lead to a gold medal. There’s a high-brow artistic component as well that can only be measured by the silent, highly subjective judges sitting along the boards of the rink. They refused to cotton to a woman who’d rather skate her program to ZZ Top than Tchaikovsky and sew her own costumes to save a few pennies. Harding’s impressive athletic prowess only took her so far. The only way to guarantee victory is if she can cleanly land that triple axel, an elusive beast because of its forward push and extra rotation in the air. When she finally nails it, director Craig Gillespie slows it down and zooms in like it’s the Zapruder footage. See the resemblance between Robbie and Harding? Anyone? “The incident.” That’s how all the characters refer to skate-gate in present-day 30 for 30-like interviews. These testimonials are a clever way to frame the narrative, and each one is a hoot. (Janney coldly stares into the camera with a bird on her shoulder, utterly unrepentant for her behavior.) They also provide insight into the titular character. Harding is a fascinating dichotomy — an asthmatic who puffs on cigarettes before taking the ice, an athlete who gorges on Dove bars, a survivor by nature who blames everyone and everything for her problems but herself. During one particularly delicious moment, Harding scoffs that Kerrigan got one measly club to the knee. She suffered a friggin’ lifetime of emotional and physical abuse. By her loved ones. By the media. And by the collective you. The accusation hurts because it’s true. No more. De-glamming for a role is easy; using nerve and verve to turn this longtime one-woman punchline into a sympathetic heroine is a downright miracle. For that, Robbie will be showered in accolades. And Harding? Well, she ain’t exactly the Billie Jean King of the figure-skating world. But she still overcame a slew of obstacles to do things her way. Maybe she deserves our applause after all. Maybe.